Art Hearts Fashion signed off FW15 Mercedes Benz Fashion Week at Lincoln Center with a monumental final show featuring the talent, creative innovation, and design theatrics that have made New York Fashion Week iconic. Models (not afraid to bare all for a good cause) wore hand crafted armor in one show, masks in another, and barely anything in the closing show for MT Costello whose grand finale astonished everyone in the room. In the completely full house of the Theatre guests took their seats, thrilled to be a part of this historic show. Celebrities including Lilly Ghalichi, Miss J Alexander, Foxy Brown, Micah Hughes, Chantelle Fraser, Mimi Faust, Members of VH1’s Black Ink Crew, Lilly Melgar, Kendall Schmidt, Karlie Redd, and Che’nelle came out to celebrate the incredible designers. Art Hearts Fashion featured Mister Triple X, Walter Mendez, House of LiJon, House of Byfield, Hallie Sara, Mimi Tran, and MT Costello. The show featured top celebrity models including Lilly Ghalichi, Shaun Ross, Miss Universe Janine Tugonon, Jimmy Q, and Anna Demidova. Mister Triple X opened the show with a sophisticated streetwear line for men and women. Bold print skirts and dresses stole the show and in the finale walk elicited cheers from the audience as the models wore the Mister Triple X bunny masks. Top Model JimmyQ and Miss Universe Philippines Janine Tugonon walked the finale with designer Erik Rosete in an unforgettable moment on the runway. Walter Mendez took the runway next with a stunning collection of elegant gowns. This landmark collection was perfectly executed with a palette of soft greys transitioning to dark blues and bold velvet greens. The high energy collection of House of LiJon featured bold patterns and the brand’s signature hand crafted wearable couture armor. The sensual and high-fashion pieces were unlike anything on the runway before. Hailing from the Netherlands, House of Byfield brought the fresh design aesthetic New York has been waiting for. 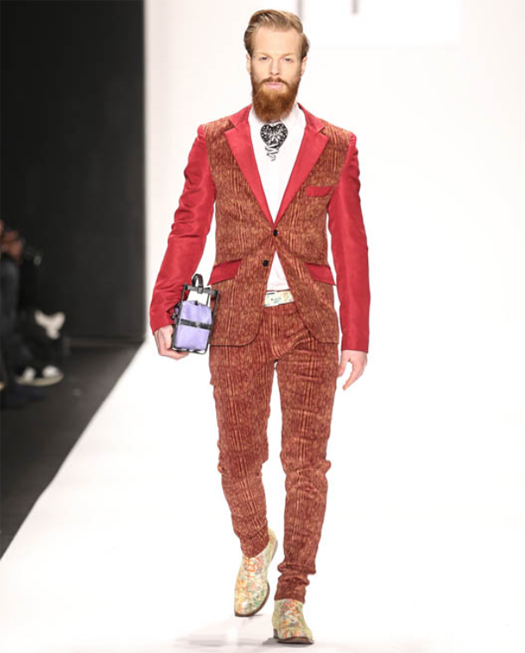 Dapper fitted suiting and men’s bags were a few of the highlights of the collection that also featured bold contemporary dresses for women. Hallie Sara’s fine luxury pieces drew in the eyes and breath of the audience. Each custom creation is impeccably crafted and reminiscent of the iconic old-world glamour and timelessness of feminine silhouettes. Mimi Tran’s collection of cocktail dresses and gowns featured daring embellishments and bold color choices. This elegant and feminine collection was a crowd pleaser. Among an immaculate collection of gowns MT Costello’s solo male model made his way down the runway wearing nothing but a golden robe and only his hand to cover his adorned manhood. Guests could barely stay in their seats as the grand finale approached. A model sauntered down the runway in a prosthetic human mask, she paused to glance at the crowd and tore back the mask revealing reptilian face makeup. A standing ovation, cheers, and a few tears from guests followed as everyone in Lincoln Center knew this was the last moment. Sponsor to the event was AIDS Healthcare Foundation (AHF), the largest global AIDS organization, that currently provides medical care and/or services to nearly 365,000 individuals in 36 countries worldwide in the US, Africa, Latin America/Caribbean, the Asia/Pacific Region and Eastern Europe. As always NYFW is a unique experience… Love!! !